First time around everything is special, and so was our trip to Photoshop World in DC. Even though my shoes were killing me right from the start, a view of thousands aspiring photographers taking Walter E. Washington Convention Center by storm was breathtaking and more than made up for it. All this excitement meant that Depositphotos had no choice but to deploy its Power Crew with Marius Klatt and myself ready to tackle the challenge. 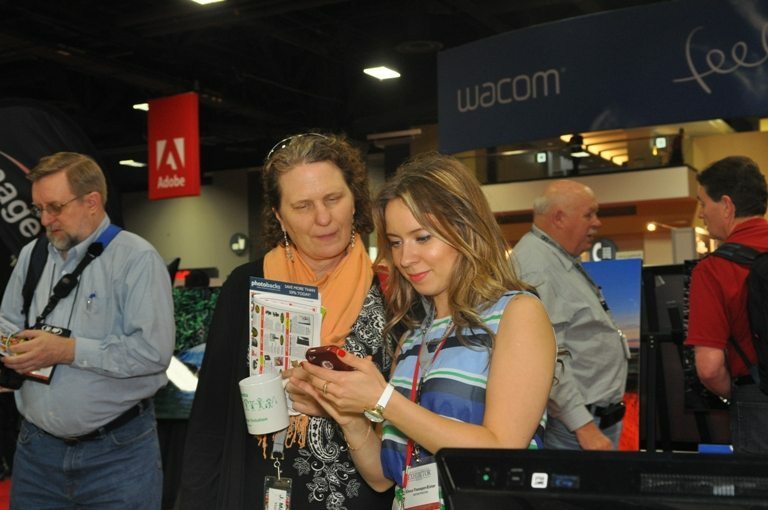 I should also give a noble mention to Scott Kelby and the NAPP guys for their efforts of keeping everyone entertained at all times, even us exhibitors (not like we weren’t having enough fun already). They started this PWS with their very own formed “Photoshop Political Party” and carried the fun all the way through. 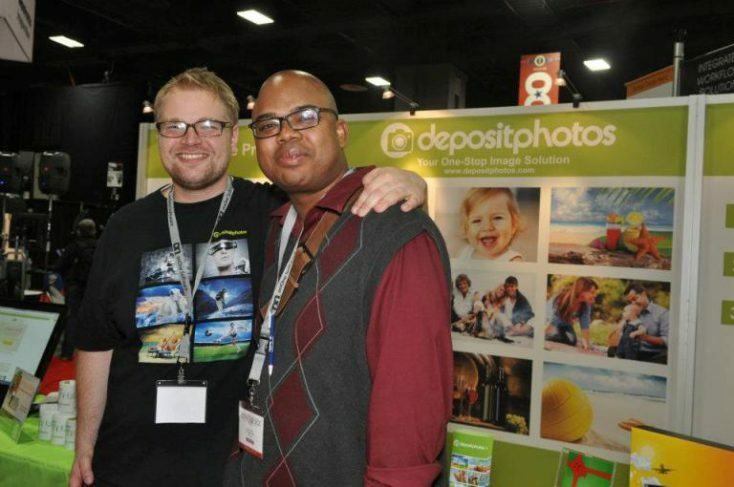 We had a chance to catch, one of the Kelby instructors, the handsome mister Douglas Sonders on camera casually checking out Depositphotos booth. It was a real pleasure to meet him! And you guys should definitely check out his class on next Photoshop World. Douglas Sounders is an amazing instructor. But it really doesn’t matter if I’m a beginner or even if I were a stock contributing pro. 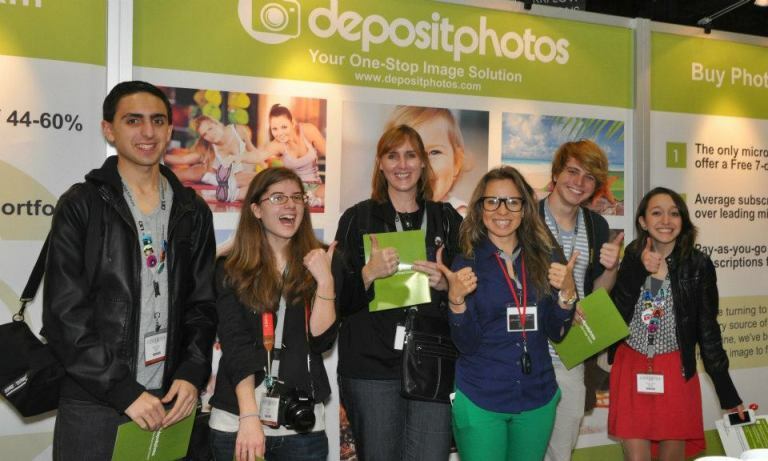 Photoshop World is a must attend show! Not only because Depositphotos was there, but also brands like Adobe, Wacom, Mpix, Moab, Adorama, B&H, Epson, Nik Software, onOne Software and so many more. We were all giving away goodies like software, gift certificates, great discounts on retail products and countless others. Many different classes and training programs featuring Lightroom4 Crash Course and Making Money Shooting Stock Photography were on for full 3 days non-stop. It was quite a treat! I must confess the only downside was that dreaded line at Starbucks. 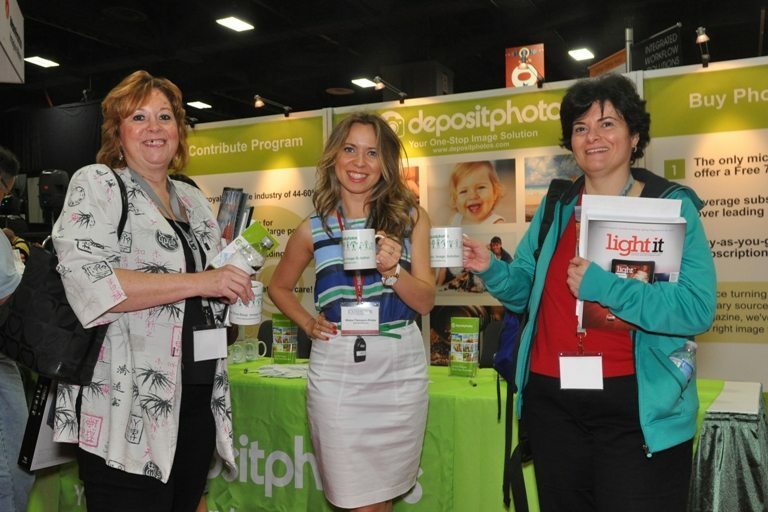 For the whole three days at Depositphotos booth 525 Marius and I were giving away cute coffee mugs to photographers (no coffee, sorry) and killer promo-codes for designers and digital artists. I have never in my life seen so many photographers and creative individuals in one place at the same time. They came from all over US and some, like my new friend Freelance illustrator and designer Richard Roberts and his colleague Fredrik, even flew in all the way from Stockholm Europe. Like a modern and innovative company that we are, we had a Depositphotos QR code set up to let people double their chances in winning an amazing Bamboo Create Tablet by Wacom. And more than several times I had the liberty of tutoring attendees on how to use a QR code scanner application on their smartphones. Doesn’t it feel great bringing innovation to people? I should try registering as an instructor when the next PSW comes around. But no matter how many chances you get we all know that there can only be one winner. His name is very well known to us by now – Rob Baker a senior web developer at Eye Street Solutions. He barely made it back to our booth before the whole expo closed the doors on him and we’d have had to take the tablet home with us. But right when the conference was over and everyone was wrapping up and ready to go Rob has actually showed up. He had to miss a meeting, he told us, and yet I think it was well worth it. He got a brand new Wacom Bamboo Create Tablet for his team! Just to show you how generous we were I’ll mention that during the three days we were there Depositphotos raffled off 15 subscriptions worth $99 each. 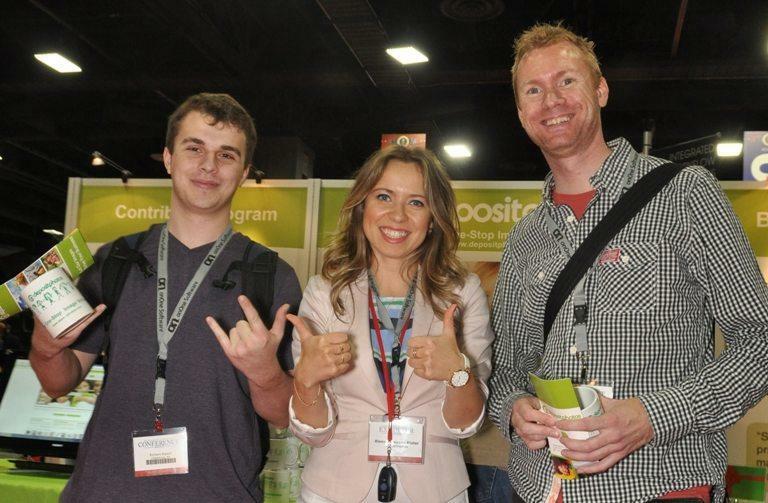 Excitement wouldliterally flood our booth every time the PSW organizers would send out a tweet with our announcement. An instant crowd would start running towards our booth waving their hands holding a phone with a tweet showing on the screen. Thisslightly confusing and at the same time exciting experience at first became really fun once we knew what was going on. Thanks to all who tried their luck getting to us first and great job guys, well done to those that made it! Enjoy your free 30 days access to Depositphotos’s media library. Photoshop World 2012 in DC was amazing. 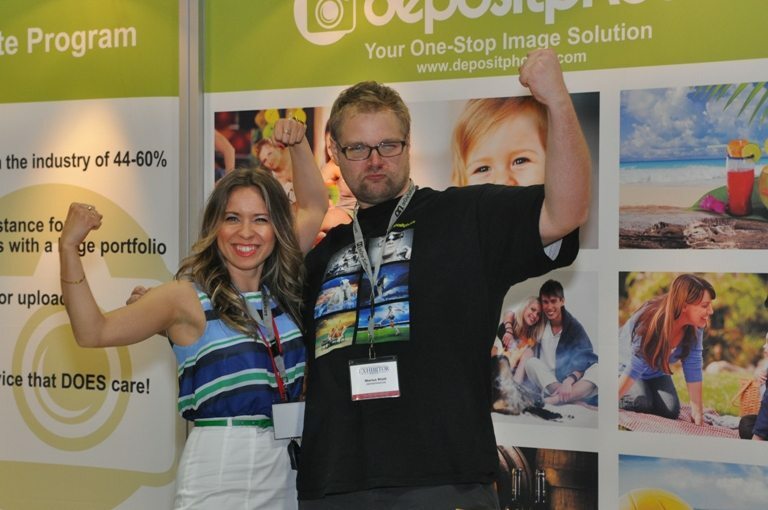 We at Depositphotos were really excited to meet all of our new friends and bring the most possible quality of service to all! And the best reward for us is the words of positive feedback. But this time it’s even more special because it came from a web designer for United States Social Security Service, Aaron. He said: “For 2 years straight I was working with you guys, and I couldn’t be happier with the quality of service and the products you have to offer”. A high five and a giant thank you, Aaron! 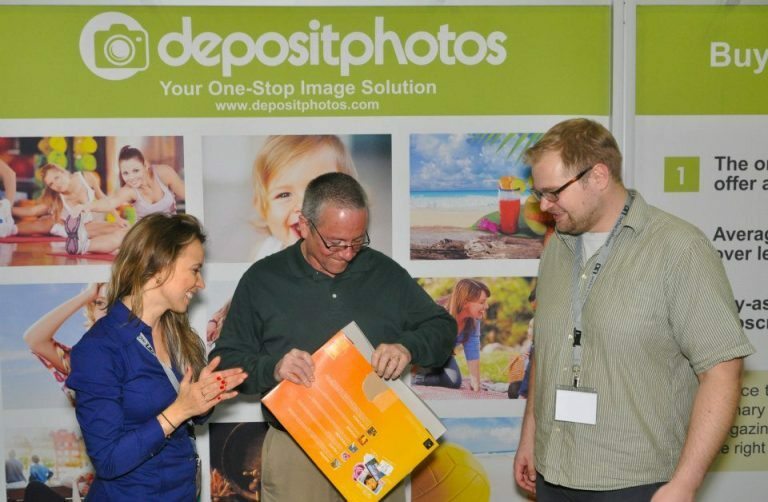 Now Depositphotos is officially Social Security approved. And on that note I would like to end this post. It was great seeing everyone single one of you and don’t forget to check out Chuck Joiner with The MacVoices Group who interviewed Depositphotos and that will soon be on the air. So stay tuned! Prev PostRon Chapple на Depositphotos!